I finally finished the pillow. Even though the stain I discussed last post is still there, it looks quite nice now that it is finished. 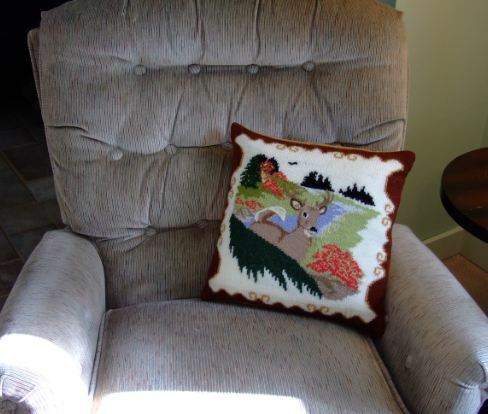 I put a fabric backing on the pillow, but will be using a knitted back for the 16 inch version. I found this lovely washable brush suede at Joanne Fabrics for the back, but before I could do that I had to do some prep work. First, I select my gold yarn, as it was the closest color to the fabric I had chosen. Using it, I knitted 4 rows around the pillow, adding one stitch each side of the corner stitches, every row but the last. After binding off the gold, I steam pressed it out so that it would lay relatively flat. During the steaming process I made sure that my pillow measured 14 3/4 inches square. Next, I took a square piece of heavy bleached muslin,(slightly larger than my pillow), and beginning where the two edges of the squares met, began to pin them together using the line created at the beginning of the salvage edge. When the pinning was done, I chose a gold sewing thread and stitched through the layers. That stitching line was my guide when I was ready to sew the fabric back on to the knitted front. I hand stitched the bottom together after inserting the form. I have to say that this particular pillow form has a lot to be desired, as the corners were not stuffed very well. For those of you who might wonder, I did try put a cording on it, but it was not as attractive as I thought it might be. A knit covered cord might work-I will try it next time. I also decided not to put a zipper or Velcro closure in the fabric back, as all the parts of the pillow are washable in cold water. I have found the my Tropicana Rose Pillow washes beautifully right on the poly filled pillow form. and then I looked down at the bottom. Yikes!!! There in living color was a lovely yellow stain, just above the scroll. Yes, I was, well let’s just say MORE than disappointed, I was crushed! I worked on it with Woolite, which usually takes out anything, but it would not move. Thinking back, I remembered the day I brought in the wood, then sat down to work on the pillow. Bad move-I didn’t wash my hands first. Talk about dumb, dumb and dumber! I know better, especially when working with WHITE. I can feel OK about this project because I experimented with several techniques, so this latest development is one of many lessons learned working out this pattern. My husband has claimed it as his own, so instead of my original plan to knit a back, I will get a piece of Corduroy to make the back with. He says he does not care if it has a small stain, he just likes the picture. So…. it’s his. 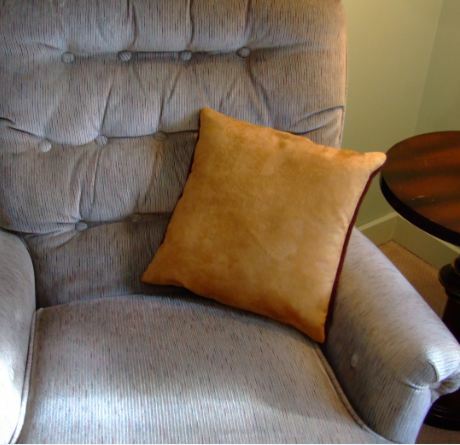 I will call this my “signature” pillow- a yellow signature, that is. So, on to the 16 inch version. Only this time I’ll try to remember to wash my hands. Maybe…..? If I can remember. I was looking over the clicks on my site the other day and noticed that the interest in what to do with leftover yarns was among the most frequent inquiries. This got me to thinking- Oh God, look out, she’s at it again!!!! But……seriously, it is a challenge when there’s not really enough to make anything worth while, but you don’t want to waste it. 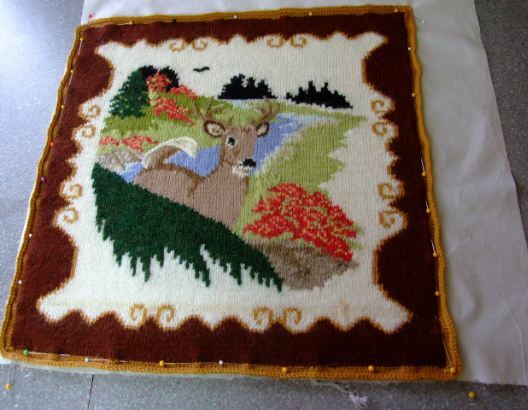 For me, of course, it can be incorporated into my Needle Point knitting projects, but for others, that don’t care for that intensive color work, it can be a problem. 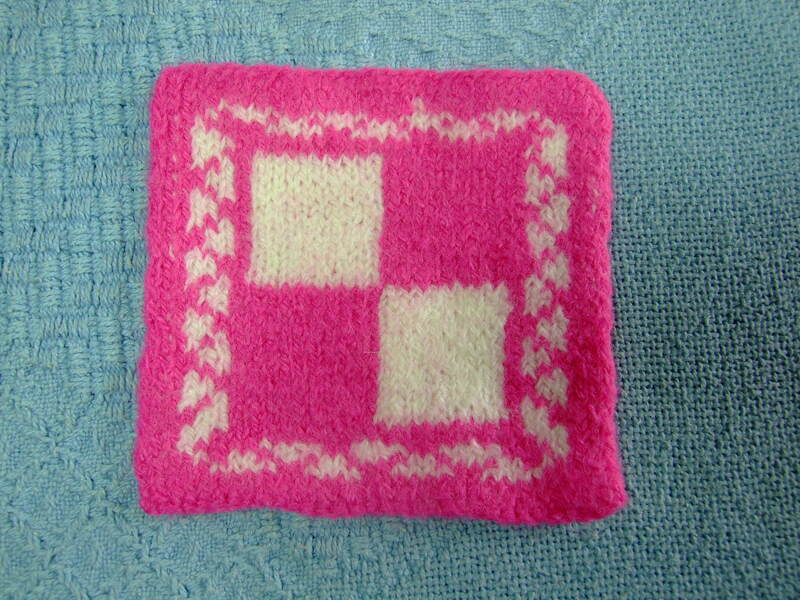 Needless to say, that within minutes of becoming aware of the issue, I happened to look down on my desk and wouldn’t you know it, there was the Double Knit Felted Chess board swatch I had made. It was the perfect size for a coaster. I believe this project would be a great way to use up your “wool” sock yarn. Using harmonizing colors, they would make a great gift. The complete instructions for this project are included in my Felted Double Knit Chess board which you can upload from the pattern catalog page. Download the coaster chart below. One of the premier lessons in working with color is pre-planning. Instead of just winging it, I have discovered that a few minutes of thinking through the placement of new colors, saves me lots of stress. Because I chart all my pictures, it only takes a few minutes to go over the color changes and plan my attack. My focus is always to eliminate yarn ends that have to be woven in later, and to reduce as much bulk as possible. Smooth and flat is the goal. First, I look for those spots where I can work my new color in two directions. The box in teal ( the eye) is a perfect example. The “V” indicates where I will make my new stitch by picking up the yarn in the middle of my long strand of white. I will then have two long tails to work with. One (A) will be used to go up the right side; and the other (B) will be used to go up the left side of the eye. The “black” or center of the eye, will be worked with one single strand. Just by using this method to work the white around the eye, I have eliminated 2 yarns ends that would have had to be woven in when the project was finished. 3. If you look closely, you can see two more “V’s” in the antler area. Yes, I have found a couple of more places to use the double long tails. I have also indicated the direction that I intend to work those ends. All this is to say that no matter how you decide to work your color project, you will be much happier with the results if you take a little time to do some planning before you start. Working out my “Painting with Yarn” series has challenged me to learn the various methods of using colors. 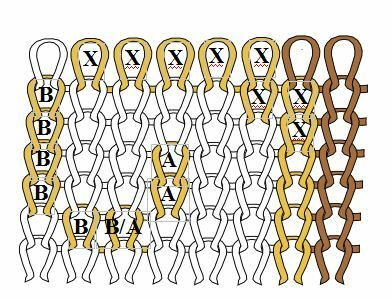 It is easy to draw the picture, but knitting it is a different story. 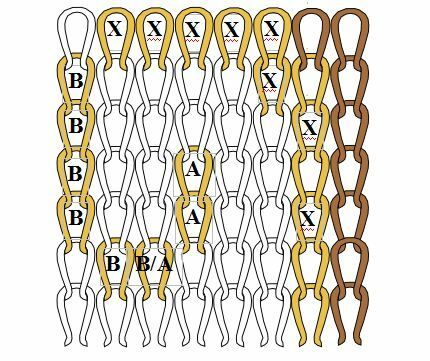 Everyone who has knitted Intarsia, and Fair Isle or Nordic knitting, know that it takes practice to get the tension right, especially when knitting in Fair Isle- keeping those “floats” in the back from getting to tight or causing puckers is a common problem. 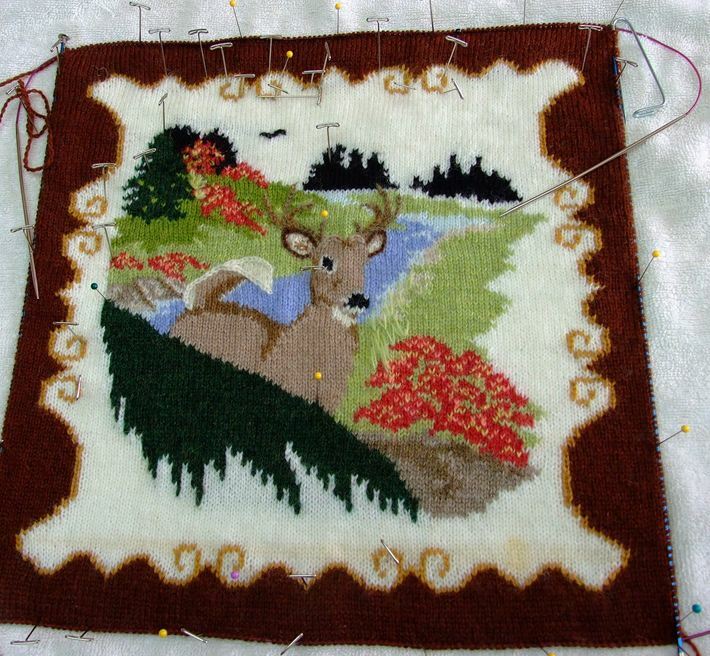 The same issues comes up when working in Intarsia, when lifting the yarn from underneath to change color. Keeping the tension on the yarn so it lays flat is the key- at least for me. All these issues can make it a bit scary for someone who has never worked with color before- that was me about a 2 years ago. Now, however, I can’t wait to sit down with my charts and knit away. To that end, I thought I would start a“Colorworks” tip page. I hope to share my experience with written instructions and illustrations. The aim is to encourage the timid to give it a try. Since I am in the middle of working on my Whitetail Buck 14 inch pillow, I will be using that for my illustrations. 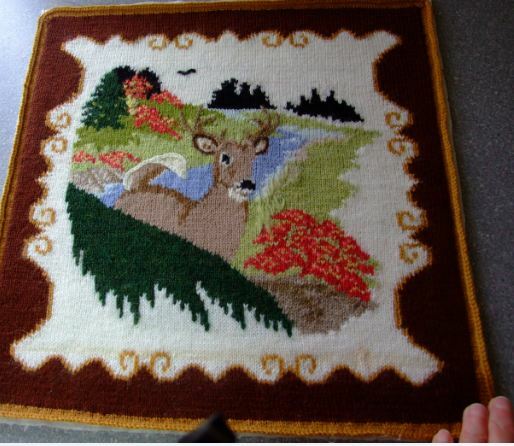 When I am done with the project I will put the pattern on my website for you to upload. OK! Here goes!! First tip! NO- hold it! I have to clear up a couple of things first. First off, I dislike using yarn butterfly’s. I can’t tell you why, but I just do. I prefer pealing off two arms length of the yarn and just letting it hang around. I prepare for this method by rolling about 1-1 1/2 inch balls of all the colors I need in the project. Then I throw them all in a plastic Ziplock bag. Next- I always use a spit splice to add yarn to my strands if needed. I do this by unwinding about 2 inches of yarn. I tear off about 2 inches of one of the plies. I repeat this with the ends of the yarn I am going to add to. I wet both ends in my mouth then over lap the two, one ply strands, making sure that they are at least 3/8 inch beyond the tear. With the strands laying on the palm of my left hand I rub the strands vigorously together, finishing by rolling them in one direction to match the twist of the original yarn. This method does not produce lumps or bumps that show in your work. It is worth the time is take to do it. And… when you get good at it, it just take a few minutes to do. Let’s start with the scroll edge of the pillow. 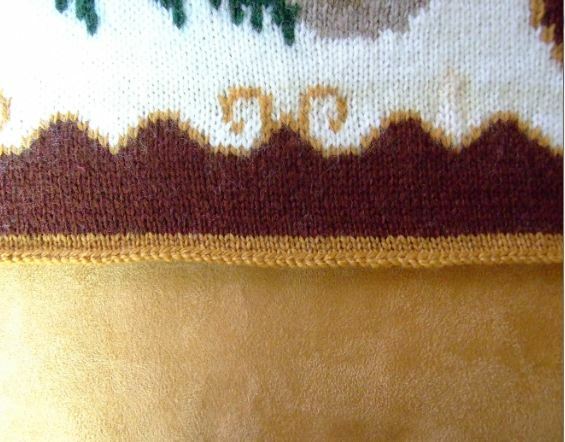 The above sample chart is part of the border around the motif. The illustration above shows how I inserted a new gold strand of yarn, picking is up in the middle to make the first stitch. 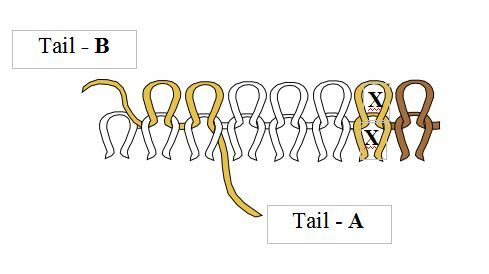 This leaves two long tails on both ends ( A and B). 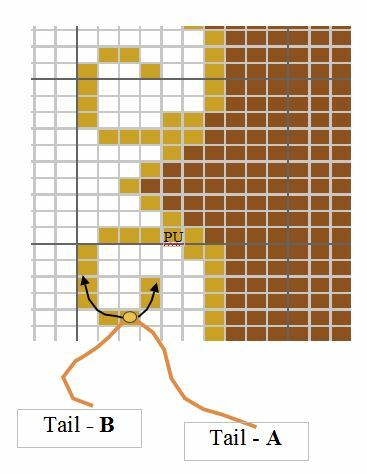 The arrows show how I plan to use the tails to created the needed stitches; tail A goes up and to the right; tails B to the left. The White yarn is carried across and worked as needed. I use this anytime I see that I will be working the yarn in two directions. I did this a lot in my Tropicana Rose Pillow. I saved me hours of weaving in yarn ends. Below is the actual stitch illustration. 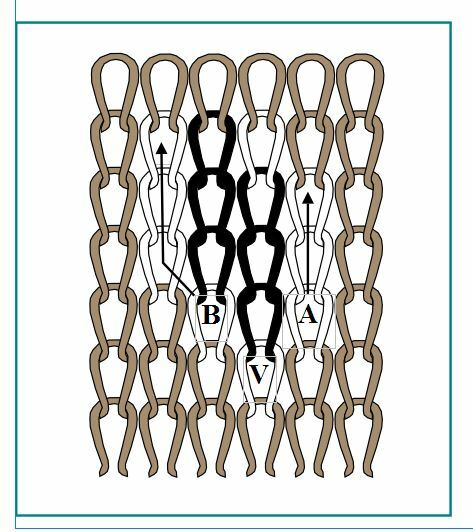 B/A = the first stitch of the new strand. 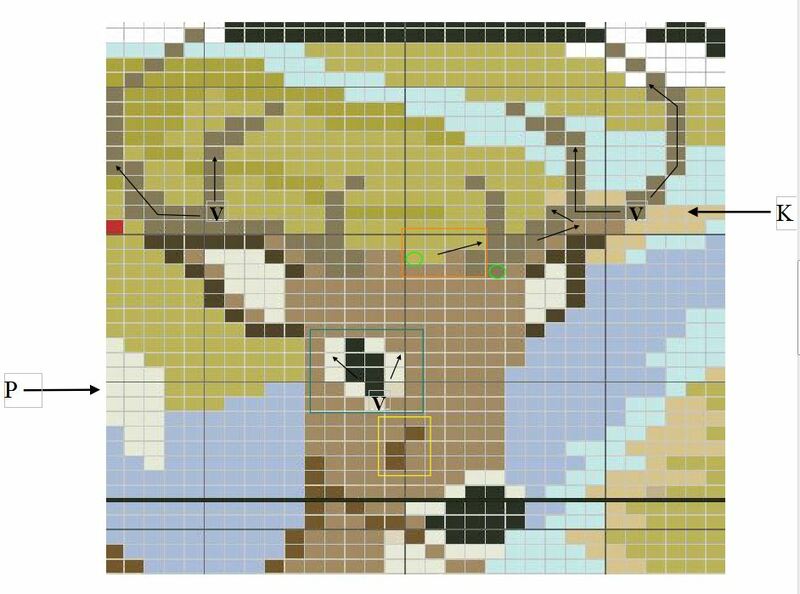 Above is the actual layout of this portion of the chart in stitches. You can see clearly how each end of the tail of the one strand is utilized, then X finishes off the scroll. The A and B tail ends will be woven in later. I posted this just to wet your appetite! PS- That little “PU” in the chart, reminds me to pick up the white yarn to be carried across.